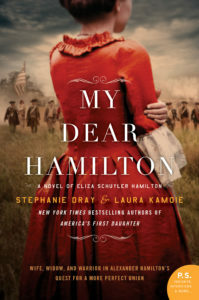 My Dear Hamilton hits USA Today Bestseller List. Thank you readers! 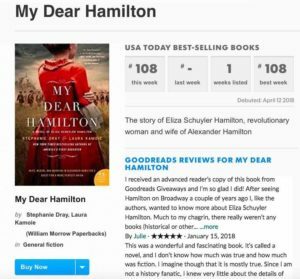 Yesterday, while on tour for the launch of our new novel about Eliza Schuyler Hamilton, we got the amazing news that My Dear Hamilton hit the USA Today Bestseller list in its release week. This is all because of you, readers and we’re so grateful! This book was a labor of love–our endeavor to show a northern Founding Mother to compare with Patsy Jefferson in America’s First Daughter, and we’re humbled and grateful that it has been so well received. « My Dear Hamilton releases today!